How will the Indian market take to this one? Asus' gaming brand, Republic of Gamers (ROG) is set to launch its first gaming smartphone in India on November 29. The upcoming phone is said to be the first in the world with a 3D vapour-chamber cooling system. 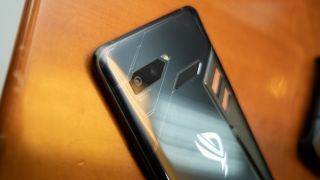 The Taiwanese company first unveiled the Asus ROG Phone at Computex in June 2018, and now, almost five months later, it's finally set to arrive in India. Neither price nor availability details of the phone are currently known. The highlights of the Asus ROG Phone are the gamer-centric design with side-mounted ports optimised for landscape mode, a 90Hz refresh rate, ultrasonic AirTrigger touch sensors, and a 1ms response time. The device is powered by a custom Qualcomm Snapdragon 845 SoC, clocked to an upper limit of 2.96GHz, alongside a Qualcomm Adreno 630 GPU optimised for gaming. In addition to the GameCool vapour-chamber cooling system, there is also a detachable Aero-Active Cooler for extra cooling. The ROG Phone comes with the optional TwinView DOck for dual-screen handheld mode, a Mobile Desktop Dock for desktop-style gaming, and a Gamevice controller with WiGig Dock for big-screen gaming. The device is powered by a custom 2.96Ghz octa-core Qualcomm Snapdragon 845 SoC, alongside a Qualcomm Adreno 630 GPU optimised for gaming. It runs the ROG Gaming UI, and has a 6-inch full-HD+ AMOLED display (1080x2160). The display also boasts a 108.6 per cent DCI-P3 colour gamut, and 10000:1 contrast ratio. Connectivity options run the gamut: WiFi 802.11a/b/g/n/ac/ad, Bluetooth 5.0, GPS, AGPS, Glonass, USB Type-C, NFC, and a 3.5mm headphone jack. Internal storage on the device is up to 512GB, and 8GB of RAM. Sensors include an accelerometer, ambient light sensor, compass, gyroscope, proximity sensor and the aforementioned ultrasonic AirTrigger sensors. The ROG phone also features a dual rear camera with 12MP and 8MP sensors each, as well as an 8MP selfie camera at the front of the device. The phone packs a 4000mAh battery that promises 7 straight hours of WiFi gameplay. With Asus HyperCharge direct-charge technology, the company claims that the battery can be charged to 60 per cent in a mere 33 minutes. Due to the absence of pricing information, it's hard to say whether the Asus ROG Phone will be a value-for-money option. But it's definitely a fresh offering in the Indian market; its only two competitors, Xiaomi's Black Shark gaming smartphone and the Razor Phone, are unavailable in India. The ROG Phone will definitely be one to keep an eye out for.